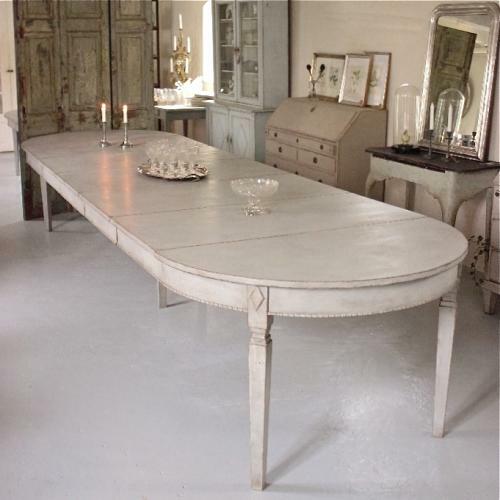 An exceptional, grand scale antique Swedish Gustavian style dining table that extends to over 14 feet in length with all five leaves inserted. This beautiful table features a decoratively carved apron and stands on elegant square tapered legs with scalloped detail and raised diamond motifs. An outstanding quality table that is very stable when fully extended, and will seat 14 adults very comfortably, with 16 to 18 possible. It can also be used as a round breakfast table, or extended by one to five leaves making it a very practical piece of furniture. Swedish circa 1890.